Updating another old favorite with fresh new photos & a couple of recipe notes. 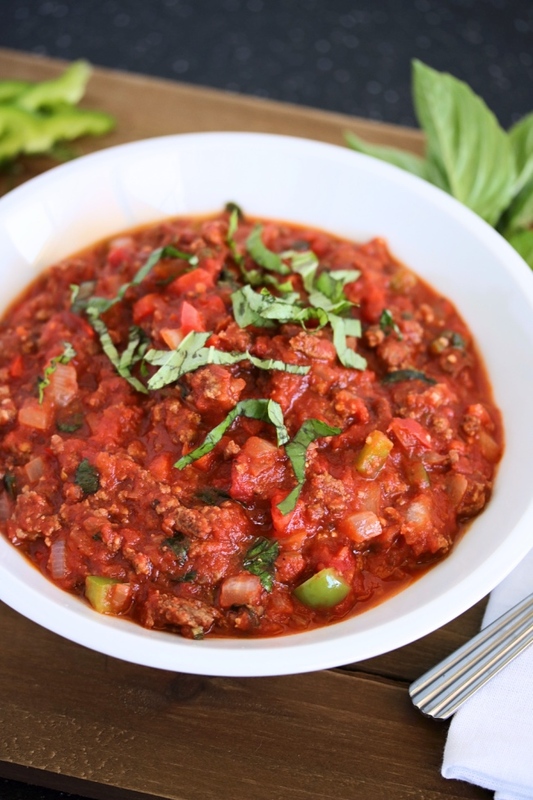 It's the same old meat sauce that we love and go back to again & again... it just looks prettier this time around! Confession: I'm the weird girl who eats an entire bowl of sauce. No pasta... just straight up sauce. 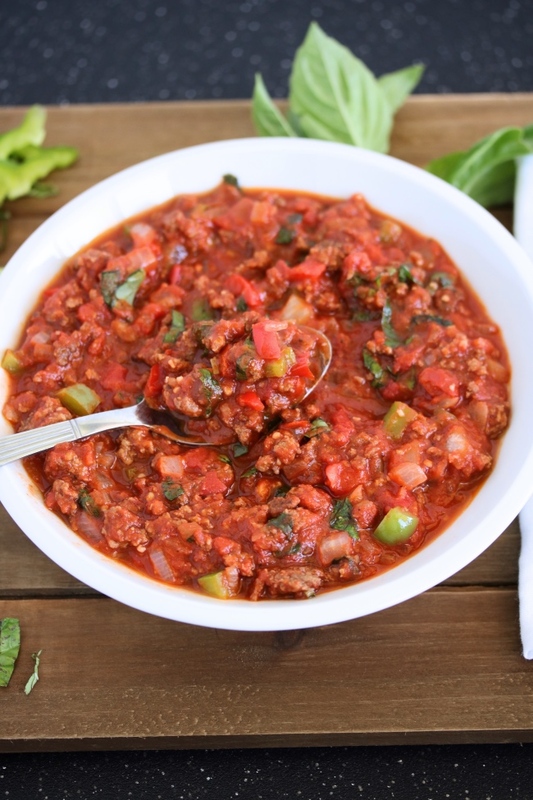 It can't be any old sauce, though-- it has to be meat sauce. 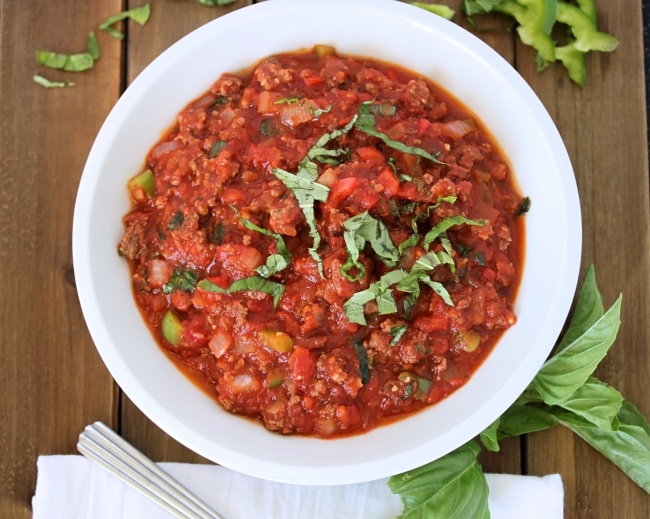 It's got to be filling & hearty with tons of ground meat & veggies. When it's made like that, who needs pasta? Okay, you're thinking I'm crazy... but try it! It's that good. 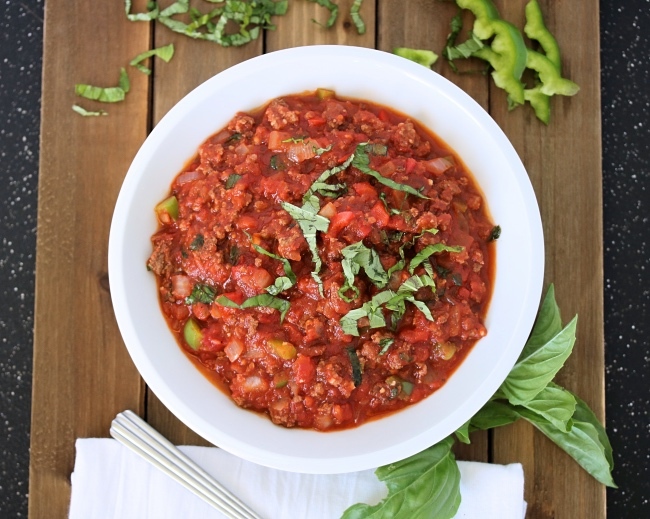 No need for a mound of pasta sitting at the bottom of your bowl, robbing your yummy sauce of all its flavor & goodness. This recipe is one that I picked up years ago from my boyfriend's mom. She made this once when I was over, & I fell in love! She's a great cook, so I assumed it must have taken her awhile to prepare... but I was pleasantly surprised when she let me in on her simple recipe. I love making a big batch of this for dinner on a Sunday, or a weeknight when I have a little extra time, then saving the rest to take for lunches & quick dinners throughout the week. It freezes well, too! So, here I am to share it with all of you-- with her permission of course! I hope you enjoy it as much as we do. In a large skillet, heat the olive oil over medium to medium-high heat. Add the ground beef, cooking until it's almost completely browned (about 5 minutes). Add the onion, bell peppers, and garlic, & continue to cook until the veggies are tender-crisp (about 3 minutes). Pour the marinara sauce over top & stir to combine. Add the basil, red pepper flakes, salt, & pepper. Reduce the heat to low, and simmer for about 10 minutes while the flavors combine. Serve hot alone scooped into bowls, or over spaghetti squash or zoodles. Enjoy! 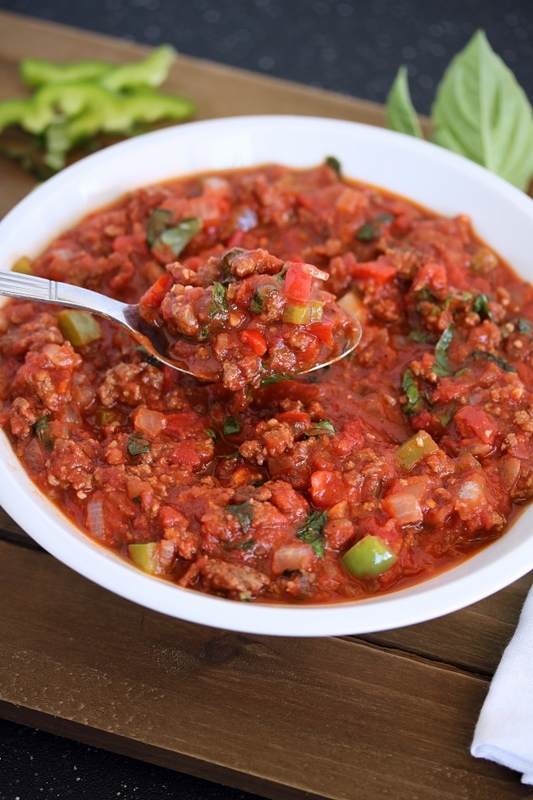 I use whatever Whole30 compliant marinara sauce I can find- always looking for added sugar, milk, or soybean oil. You can also make your own! I love "just sauce" too!! Another knockout dish. I just polished off a bowl of this with some zucchini noodles I made using my fantastic Veggetti. So simple, so filling, and so yummy. SO happy you like this! The pictures are kind of old & not-so-great, but this recipe is one of my favorites! so easy!! !